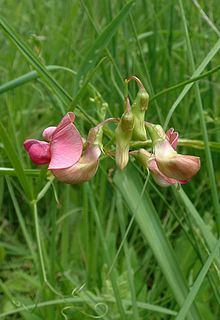 Lathyrus sylvestris, the flat pea or narrow-leaved everlastin-pea, is a plant species o the genus Lathyrus. It is native tae pairts o Africae, Europe, an Asie. The narrow-leaved everlastin-pea forms a mat o yerbage. The stems are winged. Each leaf is made up o twa elongatit leaflets. The flouers are pink. The fruit is a legume pod aboot 2 inches long. ↑ Lathyrus sylvestris. USDA NRCS Plant Fact Sheet.